It’s scary to think that a fun stroll through the woods or swim in a favorite watering hole can lead to a terrible illness, but it can –– for you as well as your dog. Leptospirosis is caused by a bacteria spread through soil, water, and the urine of infected animals, and if not caught early it can be deadly. There is a vaccine available for the most common subtypes of the bacteria that infect dogs, but it’s not always a recommended part of the routine vaccination protocol. Ask your veterinarian if the leptospirosis vaccine is right for your dog. Leptospirosis is a potentially serious disease caused by the bacterium Leptospira interrogans. It affects dogs but can also infect a wide variety of domestic and wild animals as well as humans. The organism is usually spread through infected urine, but contaminated water or soil, reproductive secretions, and even consumption of infected tissues can also transmit the infection. Introduction of the organism through skin wounds can also occur. Common carriers of the organism include raccoons, opossums, rodents, skunks, and dogs. The leptospirosis organisms rapidly advance through the bloodstream leading to fever, joint pain, and general malaise. Because the organism settles in the kidneys and actually reproduces there, inflammation and even kidney failure may develop. Unfortunately, liver failure is another common sequela to infection. Kidney and liver failure both have deadly consequences. Prevention of leptospirosis via vaccination is complicated by the fact that Leptospira interrogans has more than 200 subtypes that can cause illness in animals and people. The available vaccines protect against only a handful of the most common subtypes that infect dogs, which limits their protective value. 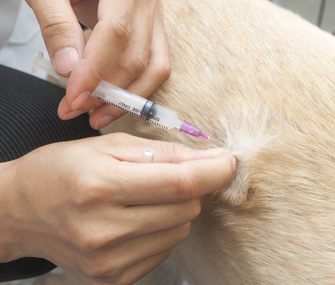 Nevertheless, the available vaccines are effective and safe when used as directed, and many veterinarians recommend the vaccination for dogs at risk for exposure. The leptospirosis vaccine is a non-core vaccine, which means it is an optional vaccine that dogs can benefit from based on risk for exposure to the disease. Veterinarians will recommend this vaccine based on a dog’s lifestyle and reasonable exposure risk. Vaccination decisions should always be made in consultation with a veterinarian so they can be tailored to meet a dog’s individual needs. For pups, the initial vaccine is administered at 12 weeks old and repeated two to four weeks later. For older puppies (over four months old) or adults receiving the leptospirosis vaccine for the first time, two doses two to four weeks apart are recommended. Annual revaccination is recommended for dogs at sustained risk of exposure to the leptospirosis disease-causing organism. Dogs at exceptionally high risk should be vaccinated every six to nine months throughout the period of their continued high risk of exposure. Administering a vaccine is a medical procedure, and there are times when a vaccine may not be recommended. For example, your veterinarian may advise against vaccinating an animal that is currently sick, pregnant, or may not have adequate immune system functioning to respond to a vaccination. These and other issues are evaluated when deciding what is best for your dog. According to some anecdotal reports, toy breeds are susceptible to anaphylactic reactions to the leptospirosis vaccine. Routine vaccination for these breeds should only be considered for those who have a high risk of exposure. Exposure to leptospirosis can be reduced by preventing your dog from drinking from puddles of standing water or from swimming in lakes, streams, or other bodies of water that may be contaminated. Unfortunately, for dogs that are accustomed to an active outdoor lifestyle that includes swimming, these precautions may not be practical. Humans can also become infected with leptospirosis, so handle dogs suspected of having the disease with care. Adhere to good hygiene techniques, such as frequent handwashing and avoiding contact with potentially contaminated urine.